There are numerous problems created by asset bubbles and many more as a result of a series of them. The financial system becomes highly destabilized, especially as authorities and policymaking bodies misunderstand them to the point of determined stasis rather than courting necessary evolution and reform, which in turn has the same effect on the economy. This is not a linear exchange, however, which is why the major alteration to the governing dynamics due to asset bubbles may really be how they mask and often hide what is really taking place. A healthy economy in the modern sense is one that fosters labor specialization, period. An economy that does not create greater participation is not a healthy economy, so in that sense or under those circumstances measuring the “dollar” value of goods and services produced and traded may be misleading. If such commerce is redirected to only specific economic segments, even determined by income (as asset bubbles tend to stratify income levels), there can be dissonance between those figures and the economy as it actually exists. Given the state of the housing bubble, it should not be surprising that the economy has been so degraded afterward; a huge recession and decline without much, if any, recovery. This is not, however, the first deficient recovery as the one that followed the dot-com recession was also insufficient. Economists include the housing bubble as part of that recovery but it really and truly was not. The underlying fundamentals of economic progress, again labor above all, were still eroding which left the housing bubble not an inseparable part of a reborn, healthy system but instead a misdirection of interpretation against continued, systemic attrition. From the chart above any non-ideological observer would have to conclude that the economy is smaller now than it was in the late 1990’s. Economists, for their ideas about preserving their ideology, continue to cling desperately to demographics alone as if Baby Boomers and retirement are enough when participation rates (rising for 65 and above, falling for those in their prime working years) and the timing of their changes are dispositive against that interpretation. Policy can attempt to cover this decline but all that redistribution accomplishes is to accelerate, even if only eventually, the decay as financialism is the main agent here. GDP would have it that this is incorrect, that there may be insufficiency in trade and broad circulation but that the economy itself is still moving forward in the right direction (and that monetarism will someday fulfill its mission to “boost” the economy to its full and upright potential). GDP by itself only measures goods and services indirectly, which is decomposed into assumptions about actual volume or quantity and further assumptions about the dollar value of all that. In other words, GDP is a removed proxy with “inflation” injected into its measure as a means of reverse engineering what is taking place in the economy. This has, of course, been the complaint of critics for years. By purposely undercounting changes in consumer prices (only one possible element or symptom of inflation) “real” GDP can provide misleading statistics. For most of our economic history, especially postwar, GDP was largely correlated with everything else so generations of economists were raised on it, and “inflation”, as if it was law. Serial asset bubbles are, by definition, debasing effects upon the dollar (and really the “dollar” is itself inflation) so any comfort about measuring inflation with precision should immediately be discarded into constructive skepticism – especially when the economy so clearly deviates in its most vital and basic expression. A few days ago, authors Kuishuang Feng, Steven J. Davis, Laixiang Sun & Klaus Hubacek published a study in Nature that suggests that the US economy has indeed shrunk. From pollution, of all factors, carbon dioxide specifically, the study links lower emissions to economic retrenchment especially after the Great Recession. To this point, reduced emissions are uncontroversial but there is wide conjecture about why. Most have focused on either efficiency in energy output and usage or the shifting mix of fuels in energy production. Fossil fuel CO2 emissions in the United States decreased by ~11% between 2007 and 2013, from 6,023 to 5,377 Mt. This decline has been widely attributed to a shift from the use of coal to natural gas in US electricity production. However, the factors driving the decline have not been quantitatively evaluated; the role of natural gas in the decline therefore remains speculative. Here we analyse the factors affecting US emissions from 1997 to 2013. Before 2007, rising emissions were primarily driven by economic growth. After 2007, decreasing emissions were largely a result of economic recession with changes in fuel mix (for example, substitution of natural gas for coal) playing a comparatively minor role. The large decrease (9.9%) in US CO2 emissions between 2007 and 2009 was primarily the result of the economic recession, evidenced by large decreases in household consumption, energy-intensive capital expenditures and export (Figs 1, 3 and 4). The recessionary belt-tightening may also have contributed to the significant efficiency gains in production structure. Since 2009, the slow recovery of the US economy has urged emissions backup, but has been closely balanced by decreases in energy intensity, especially in the transport, manufacturing and service sectors (Fig. 2a), as well as changes in the fuel mix of the energy sector. The net effect has been very little change in emissions; between 2009 and 2013; US emissions have decreased by an average of 0.2% per year. Contrary to conventional wisdom, our decomposition analysis shows that changes in the fuel mix of the energy sector (including those related to the shale gas boom) account for a relatively small portion of this decrease. Again, like labor utilization, that sounds an awful lot like an economy that shrunk in recession and stayed shrunk. Any such economic trend, a permanent decline, would properly be characterized as a depression. Even an economy that was undergoing a shift from producing goods to a deeper service sector or information society would still see a rise in emissions (from power production in particular). There really isn’t much of an intuitive leap here, as fewer people working and less pollution are really different expressions and forms of the same thing. 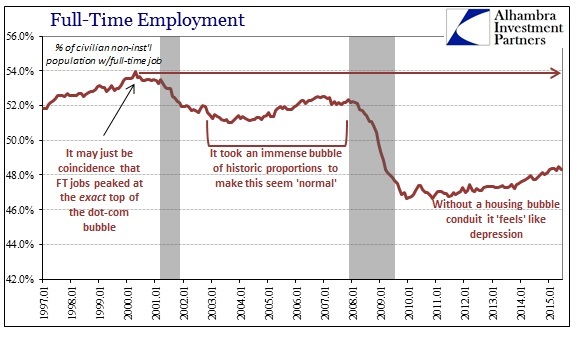 We can debate the ultimate cause of all this, but that too is intuitively easy to absorb as it correlates exactly (perfectly exact in the case of labor participation; the peak was April 2000 which was also the peak in the dot-com bubble) with serial asset bubbles. What should be much less contentious is what has resulted. It is accepted that the recovery has been lacking, but there is more than enough evidence amassed that it has never actually arrived. The US economy has been durably altered, shrunk by weight of continued socialist redistribution efforts through largely monetary intervention. All the rest of these positive numbers about GDP and related assumptions (like the Establishment Survey) are just noise further masking the depression. That itself isn’t surprising since the statistics were created under assumptions that monetarism works and works well (trend-cycle). A more informed and faithful interpretation of inflation would cure that problem.